Nitra, Slovakia was the host of the 19th international exhibition for welding and welding techniques between May 21 – 24, 2013. Kiberys Ltd presented our own line of products to the Slovakian market alongside our official distributor for Slovakia – VAW Welding s.r.o. The KBWELD welding robot attracted a lot of interested at the Kiberys stand, demonstrating high quality and speed. In April 2013, Kiberys Ltd participated through our exclusive distributor for Republic of Belarus VI-MENS Ltd. at the leading Belorussian industrial forum, Metalworking 2013, which was held in Minsk, April 09-12, 2013. Vast interest was sustained by the local industrial companies seeking automation improvements in their production. The Kiberys robotized CNC solutions were presented to a large audience from Belorussian metalworking factories and strengthened our position on the Belorussian market. KIBERYS Ltd. has shown its products for 3D robotic cutting of pipes and profiles and robotic welding at the world’s largest exhibition for the sheet metal working industry – EuroBLECH. The event was held between 23-27 October 2012 in Hanover, Germany and was attended by more than 60 000 trade visitors from all over the world. KIBERYS presented the new features in its product range: head for bevel cutting which allows better programming options and faster angle change. Further improvement is the integrated collision protection system combined with slim design. A lot of attention attracted the new laser optical seam finding and tracking system for welding. Many interested visitors and contacts from around the globe were seriously interested in our first class machinery. KIBERYS officially launched the new KBWELD HD5 welding robot, together with OXIBRAS Equipamentos Ltda. – exclusive dealer of KIBERYS for Brazil, at the Brazil Welding Show 2011 in Sao Paulo. Messe Essen and its Brazilian partner, Aranda Eventos, have created the first individual trade show for welding technology in Brazil. 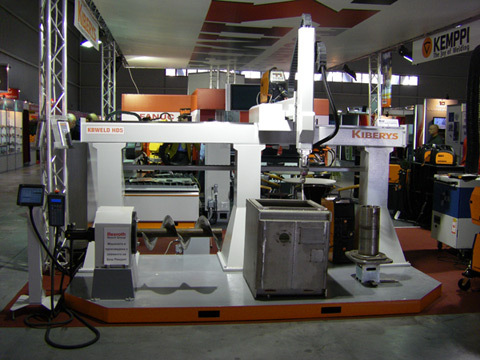 The exhibition was held between 18 – 21 October, 2011 and attracted a lot of visitor interest to the unique robotized system for cutting and welding. The stand of OXIBRAS was an attraction for the professionals in the field, especially as regards pipe cutting solutions and welding of larger metal parts and structures. For an eight consecutive year, KIBERYS Ltd. participated at the International Technical Fair in Plovdiv, Bulgaria. The event was held between 26, September – 1, October, 2011. It was a good opportunity for the professionals in the field of welding, to see the latest model of KIBERYS KBWELD HD5 with positoner for pipe cutting and welding. Another new model of the KBCUT HD CNC cutting systems was introduced at the exhibition featuring an innovative design concept. Kiberys Ltd is participating at the WIN – World of Industry fair, between February 3-6, 2011. The exhibition will take place at the TUYAP center, in Istanbul, Turkey. Kiberys is presenting its latest product – the KBWELD HD5 dual-process robotic system, which allows you to effectively use the robot for welding and plasma-cutting. The machine has an improved design and optimized graphical interface. The official launch of the new brand Kiberys by Kimex Technology at the EUROBLECH 2010 show in Hannover, Germany, attracted serious interest from the field of professional welding fabricators and sales companies from around the globe. The unique design and multiple advantage of the new welding robot KBWELD HD5, presented at the show, with its extended reach, intelligent functions, multi-process capability and novel system architecture and HMI interface was something worth seeing and getting to know. Plovdiv Fair Gold MedalThe new brand of products Kiberys by Kimex Technology received a Gold Medal and Diploma for its robotized welding system KB WELD HD5 in category “Engineering industry”. The multiple advantages, extended reach, intelligent functions and HMI interface of the KB WELD HD5 robotic system for hybrid welding and cutting processes have been distinguished with the highest prize by the Honorable Jury of the most prestigious business forum for investment goods and technologies in Southeastern Europe.